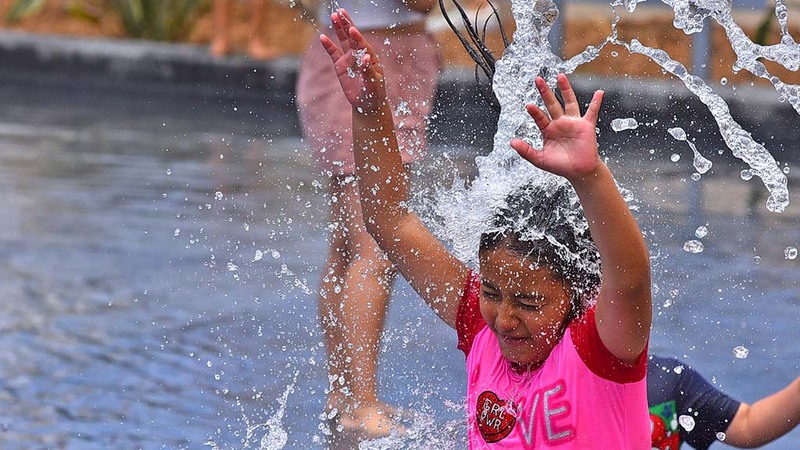 The San Diego area continued to bake under a record-setting heat wave Tuesday, with many locals sweating out mercury readings in the triple digits as the region awaited a modest cool-down forecast for the end of the workweek. The harsh summer hot spell, which began in earnest Monday, pushed temperatures into the mid-80s along the coast Tuesday afternoon, to 105 in the inland valleys, to the high 90s in the mountains and past the 120-degree mark in the desert, according to the National Weather Service. Among the sky-high highs were 103 in Ramona, 105 in Valley Center and 121 in Ocotillo Wells. In the Borrego area, the Sahara-like conditions set a new heat record of 118 degrees, beating the prior July 24 milestone of 116, set in 2014. The top mercury marks in San Diego, Ramona and Campo, meanwhile, tied those communities’ existing record highs of 85, 103 and 107, respectively. Due to the severity of the swelter in the local forecast for much of the week, an excessive-heat warning will remain in effect in the county through 8 p.m. Thursday. Amid such conditions, authorities urge the public to stay hydrated by drinking plenty of water or other non-alcoholic fluids, to seek out shady and/or air-conditioned environments and to check up on relatives and neighbors — particularly the elderly or home-bound people — to ensure that they are OK.
A list of local public “cool zones” is available online. The high-pressure atmospheric responsible for the heat wave will weaken slightly from Friday through the weekend, resulting in somewhat lower but still above-normal high temperatures, meteorologists said. A return of monsoonal moisture over the weekend could bring thunderstorms to area mountains and deserts from the weekend through early next week, the weather service advised.